73. Who would you hire as a risk manager? Alex Sidorenko from RISK-ACADEMY talks about important decisions a person must make when hiring a risk manager. Which skills are most important? At RISK-ACADEMY we have compiled free videos of lectures, seminars and interviews with Russian risk managers, as well as free templates and examples of the tools required for the implementation of elements of… Continue reading 73. Who would you hire as a risk manager? 70. How to assess risk management maturity? Alex Sidorenko from RISK-ACADEMY talks about measuring risk management maturity in non-financial companies. 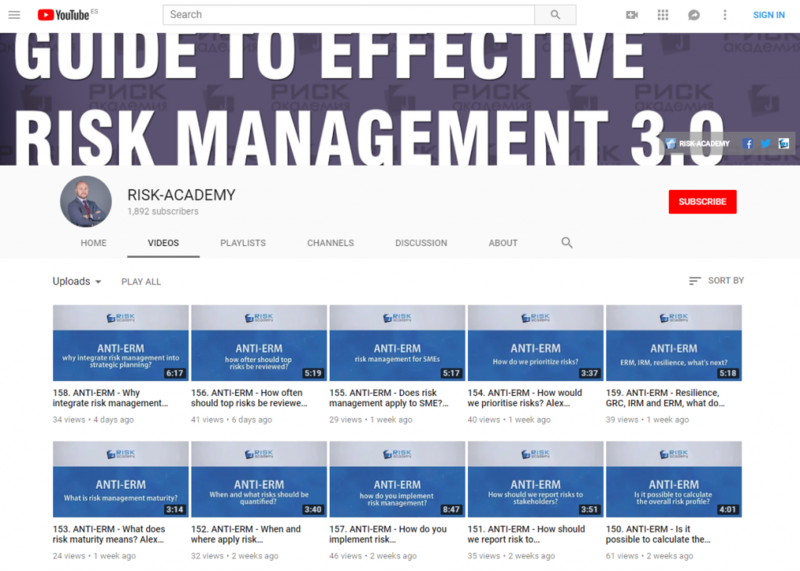 At RISK-ACADEMY we have compiled free videos of lectures, seminars and interviews with Russian risk managers, as well as free templates and examples of the tools required for the implementation of elements of risk management in the organization of small and medium-sized… Continue reading 70. How to assess risk management maturity? Alex Sidorenko from RISK-ACADEMY talks about how long should a typical risk assessment take and why most modern risk assessments in non-financial companies are seem to be missing the point. At RISK-ACADEMY we have compiled free videos of lectures, seminars and interviews with Russian risk managers, as well as free templates and examples of the… Continue reading 72. How long should a typical risk assessment take?